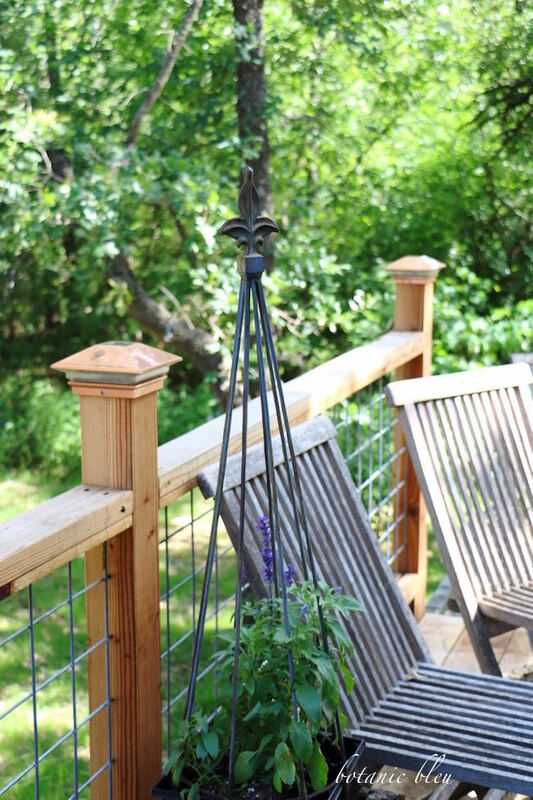 All of these are spring deck refresh moments that can stretch into H O U R S that exhibit French style living. Savoring every activity without rushing to the next thing on the to-do list creates moments in time for L I V I N G.
I have just about mastered the mid-afternoon nap, but need to work more on late-night star gazing. 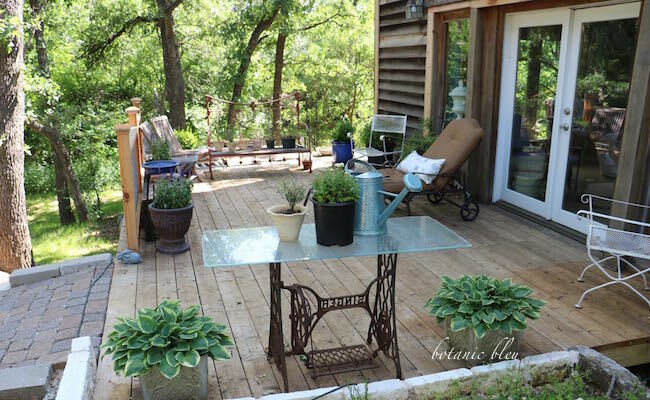 The other kind of Spring deck refresh, French style, is to refresh the living spaces and to inject French style elements. 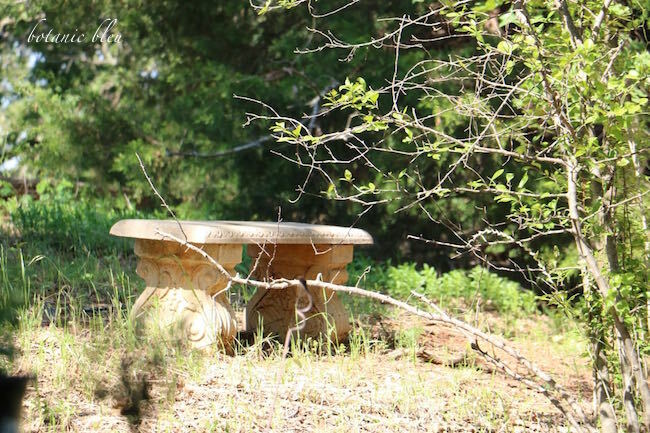 On the hillside is an old concrete bench that has a rusted spot on the top of the bench. 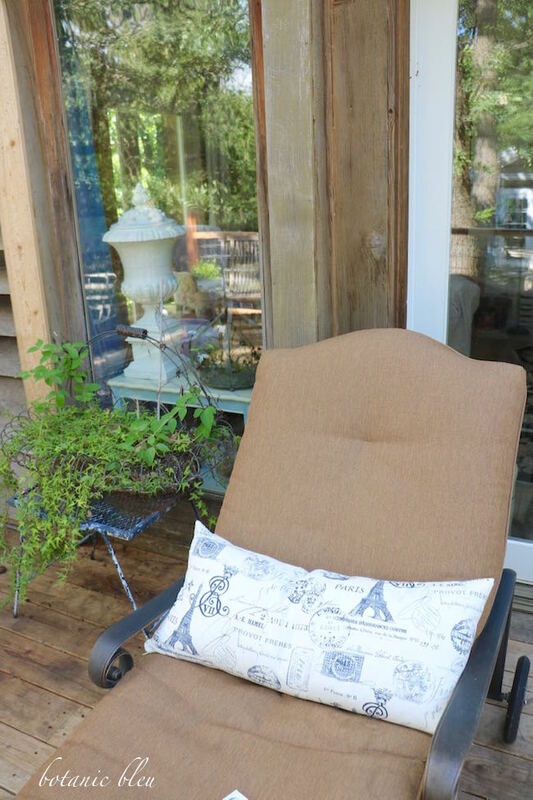 As I looked at the old redwood bench on the deck thinking about replacing it, I wondered why I had never thought of using the concrete bench in its place. Sometimes you just have to see things with a new perspective. The detail on the supports add French style that I love. 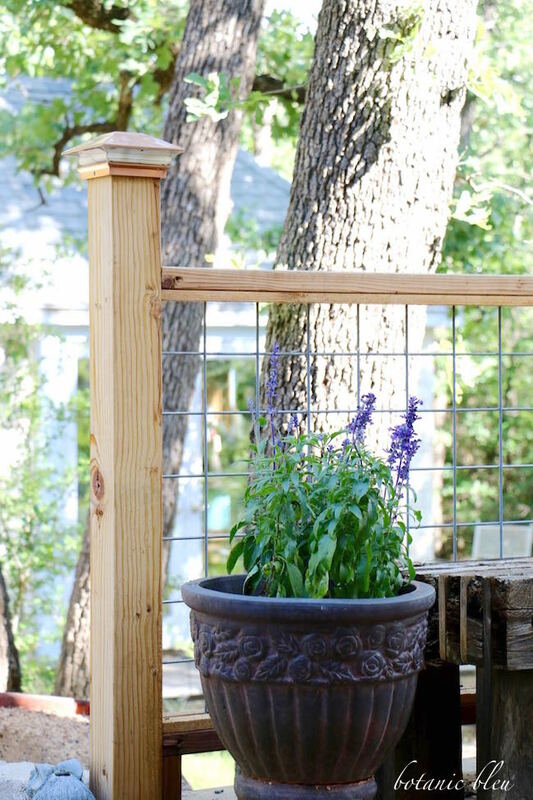 Moving this concrete bench to the deck has just been added to the to-do list. One of the hallmarks of French gardening is the use of symmetry like the two concrete planters with hostas on either side of the glass-topped vintage Singer sewing machine iron base. A metal watering can and a creamy ochre clay pot on the table top add more French details. Adding a short white limestone stone wall this Spring is another bit of French style. 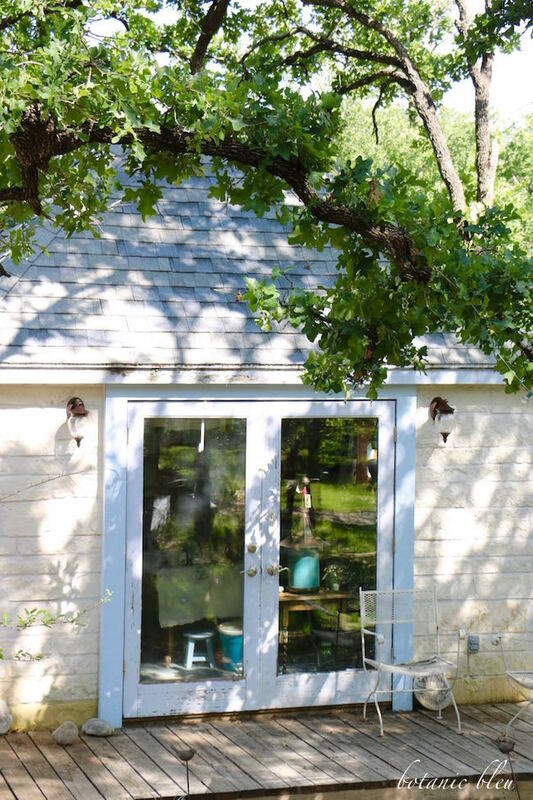 Things still to do include cleaning up the debris from the stonework, weeding the area, regrading the soil behind the new limestone wall, and repositioning the extension cord used for outdoor lighting. 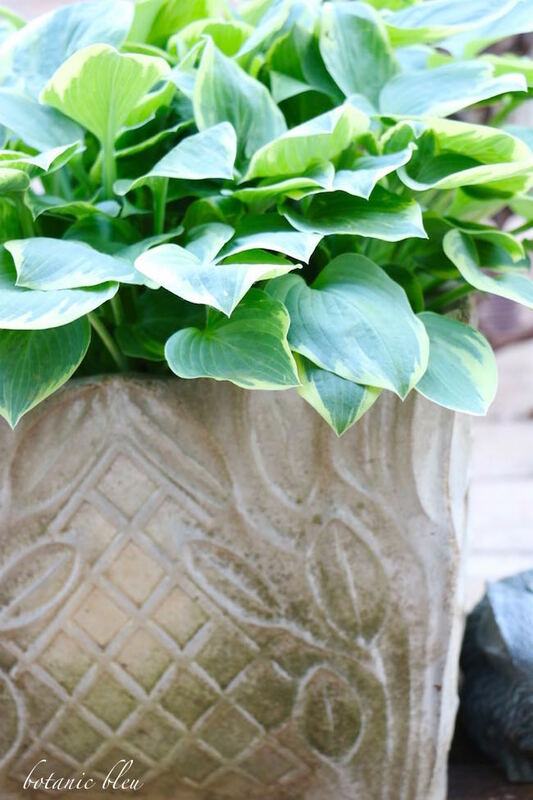 Hostas thrive in the concrete pots on the deck that receives morning sun and afternoon shade. It is time to divide these plants, another thing on the to-do list. 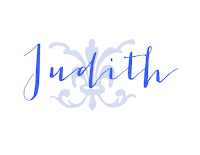 More French details include a white urn in the living room that is visible through the window and a blue and white French script lumbar pillow for lounging on the chaise. 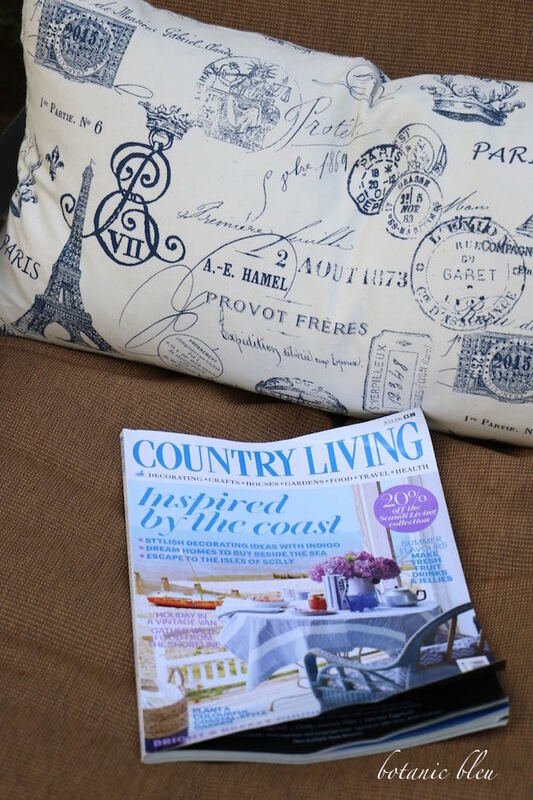 Sitting outside to read Country Living, UK, the only magazine subscription that still comes to my house, is one of the ways to while away the hours in living. Articles about raising animals, sustaining environmentally-friendly gardens, and spotlighting artisans of dying traditional arts are delightfully written and informative. Plus the featured houses and decor are different from the styles seen in most American publications. A fresh take on centuries old architecture intrigues me. 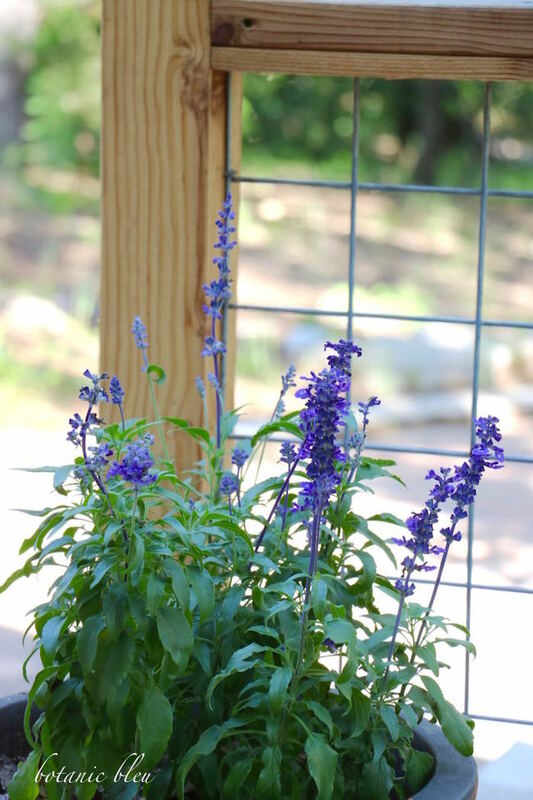 A footed flower pot holds blue sage that attracts bees and butterflies. Potting the rest of the starter plants of blue sage and cleaning the French style slatted deck chairs are also on the still-to-do list for refreshing the deck. Another mid-day break from gardening is needed. Bring out the lemonade. If the winter is mild, the blue sage flowers will return next year. Adding potted topiaries on either side of the French doors of the garden house is also on the to-do list. 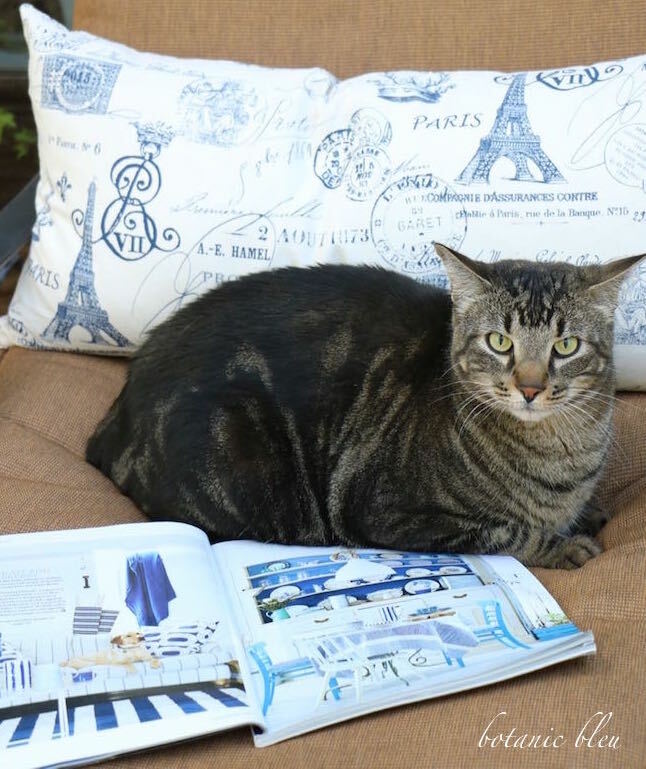 While there are still Spring deck refreshes, French style, to do, rest assured they are not keeping me from Spring deck refresh, French style, L I V I N G.
Indiana also enjoys the chaise and sitting on the Country Living, UK magazine. 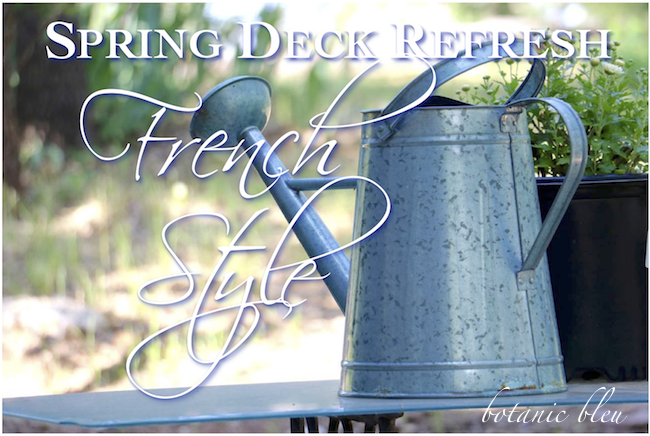 He has Spring deck refresh, French style living, mastered. Indiana and I will post another view of the deck after more things on the to-do list are completed. I never have to worry that you don't have enough to do.... :) Love your darling Indiana. Enjoyed viewing the deck and yard. I'm with you on reading British publications. I can't seem to get enough of them. The homes are not quite as polished as the American homes in our magazines. That makes each home much more interesting and endearing. 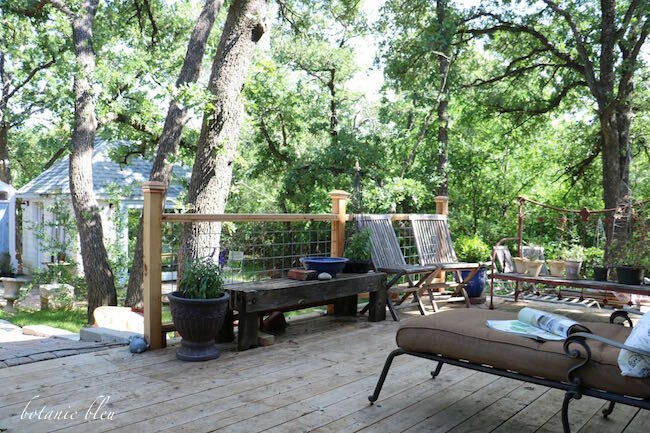 Your deck is so inviting. It's a rainy day here, but we are out in the sunroom all the same. it's dark and gray, but love the gentle sound of the rain. Good luck with your projects. Love the concrete bench. We've two that we moved here from our previous home. They are down in the lower wooded area, but I often think of bringing them up to the garden to be enjoyed. I think I'll put that on my list. Il faut toujours avoir un chat dans le jardin! JOLI! 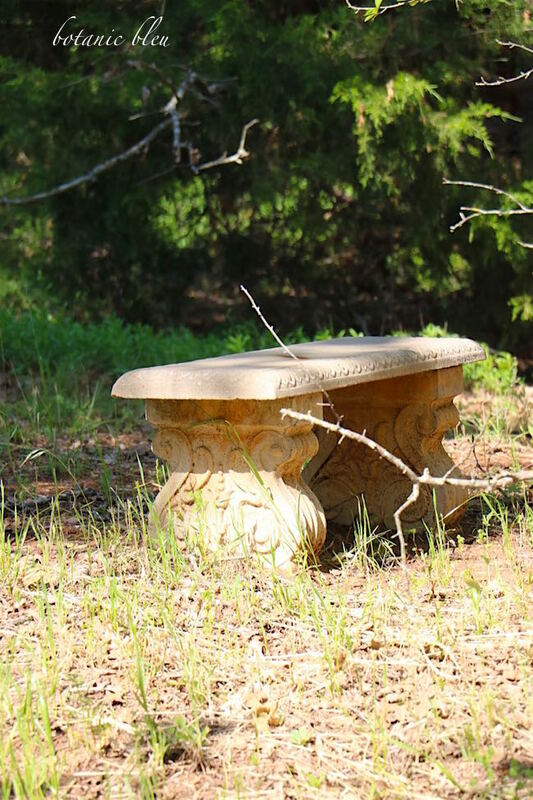 I am often tempted to buy one of those beautiful concrete garden benches, but then I think about getting it home... 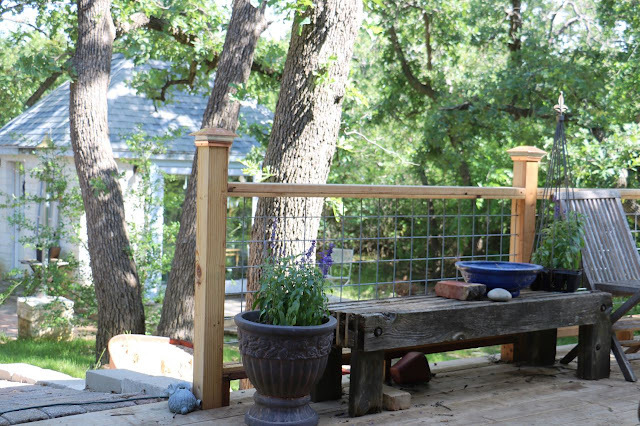 Your deck looks very peaceful and inviting. Enjoy. Lovely setting. I find many UK rooms that are much more appealing to me than our current trends. This is just so pretty! I love your setting in the trees. 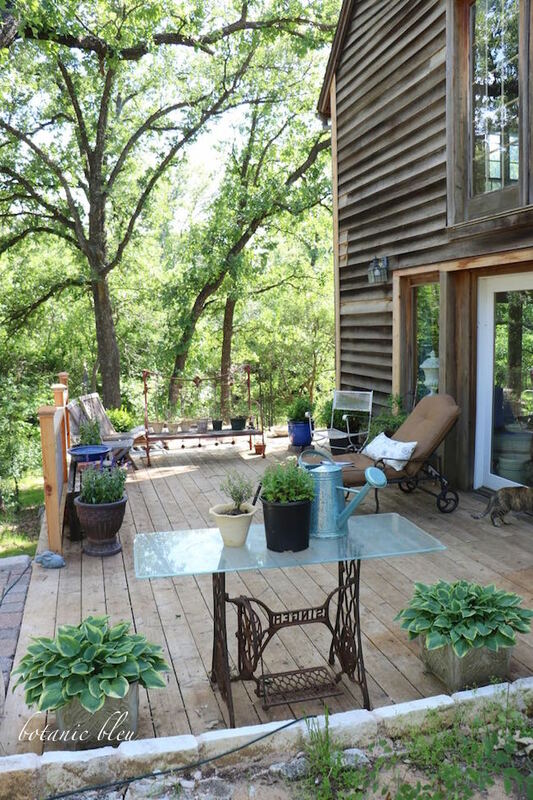 The deck is so nice and big and your french touches are right at home. What a gorgeous outdoor retreat! Love all of your french touches. Enjoy your weekend! Ahhhh, relaxing and inviting spaces. Purr-fect for LIVING. Love all your pretty touches, looking forward to seeing more as you and Indiana get things done! Beautiful deck! Love that cat's name! Thanks for joining Home Sweet Home! Your deck looks absolutely wonderful! What a lovely spot to relax! Good luck with your "to do list" and make sure you do an "after the refresh" post too... I'd love to see the results.